As your child gets older and reaches the age where they are expected to lose their primary teeth and see their permanent teeth come in, you may notice that they have two sets of teeth. For many parents, this may seem like a concern, but it’s actually quite normal. This situation may require a trip to your dentist in Fresno CA to examine exactly what the impact of this condition will be but it typically doesn’t become a problem. Primary teeth, often called baby teeth, are the first teeth that come in. They can enter the mouth at any point between the ages of four and eight but usually come in around the ages of five or six. These teeth are important because they hold place for the permanent teeth that will eventually come in. If the baby teeth are taken out too early due to tooth decay or some other problem, the permanent teeth may come in a position in which they are not intended. The way the move from primary teeth to permanent teeth typically works is that the permanent tooth slowly dissolves the primary tooth’s root as it erupts. Eventually, enough of the root dissolves so that the primary tooth loses its attachment and falls out. The permanent tooth then comes into the vacated spot left by the departed primary tooth. Why Two Rows of Teeth? Typically, the permanent teeth will erupt right underneath the primary teeth which will cause those teeth to begin to wiggle and eventually fall out. However, sometimes the permanent teeth will erupt right behind the primary teeth through no fault of the child. In this situation, you may see two rows of teeth in the mouth. This condition is usually referred to as “shark teeth” because sharks are known for having two rows of teeth in their mouths. While parents may be concerned when they see multiple rows of teeth forming, it’s usually not a problem. If your child has this condition, you may want to take them to the dentist to ensure that everything is fine. The dentist may want to take x-rays to see how much of the root of the primary tooth remains. Occasionally, this x-ray will indicate that the tooth is in need of removal though it will often fall out on its own in a matter of weeks. When Does This Condition Occur? If two rows of teeth do form in your child’s mouth, it’s likely to happen during one of two points of their oral development. The first comes when the child turns six years old. At this point, the permanent lower incisors, the narrow-shaped teeth, begin to erupt. If these teeth erupt behind the primary tooth rather than directly underneath the primary tooth, it will cause two rows of teeth. The second period in which two rows of teeth might occur happens when the child is around 11 years old. At this point, the upper back molars begin to appear. Like with the permanent lower incisors, these teeth may begin to erupt from directly underneath the primary tooth, pushing it out. However, it may also erupt behind the primary tooth developing two rows of teeth. 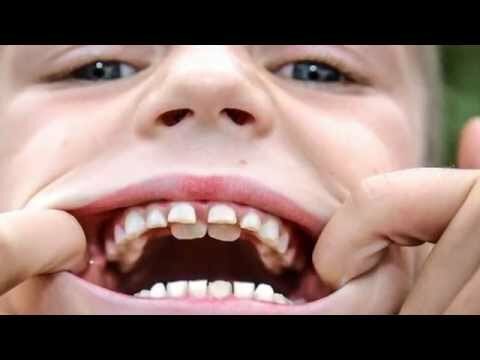 It’s quite common for children to form two rows of teeth. In fact, about 30 percent of children end up with two rows of teeth before their primary teeth finally come out. The common part of the mouth for this to occur is in the lower front teeth. These lower front teeth tend to come in around the ages of six or seven years old so children are more likely to have this occur around that age. A child forming two rows of teeth during the time that their permanent teeth are coming in is a condition commonly known as shark teeth. While it may seem as though this is a situation in need of immediate help, it rarely causes a problem for the child. Sometimes, a dentist may need to extract the tooth to give the permanent tooth the appropriate room to erupt but often the tooth ends up falling out on its own over the coming weeks. If you’re looking for a pediatric dentist for your child, come to Dr Donan Pediatric Dentist in Fresno CA for quality care.